#MOONBEAUTY goes LIVE today at 5pm with celebrity hairstylist and geminijunemoon creative team member Kristen Parks (IG: @kristenparx) as she takes our editor, june ann d'angelo's haircolor #tothemoon for #ULTRASTL that we are proud to be hosting alongside ALIVE MAGAZINE this coming Saturday night! follow @geminijunemoon and @kristenparx on IG tonight to see just how Kristen Parks uses Olaplex, Redken Fast Lift Lightener and the Pravana vivids to introduce st. louis to the #rainbowtrend that's sweeping salons across the world right now! I know you've probably seen plenty of articles like this, and while some are pretty honest, I feel like they have left out a few things! So here's my list of things you should know revolving around your hair stylist! I can't really say that any other way. It is SO important for you to be on time to your appointment. There is a small five to maybe ten minute buffer in there, but I promise your hair stylist with appreciate you being on time more than anything! Typically, we plan some time for talking about a game plan, and then just enough time to execute that plan. So if you're 15 minutes late, that puts our entire schedule 15 minutes behind. Which means that everyone the rest of the day will be waiting an extra 15 minutes on us, if they are on time... if they are late too, well the day's timing is completely out the window! If you know you're going to be late, check in with your stylist or salon and make sure there will still be time for you after you have arrived! We totally understand that things and life happen! But give your hair stylist AS MUCH notice as you possibly can if you need to cancel your appointment. If we have time, we can try to give your appointment time to someone else to keep our day busy! Sitting around doesn't make us any money! But again, we do definitely understand that last minute things happen in life that are out of everyone's control! I love to get my clients through their big changes. However, if we plan for your usual root touch up and not for a big change, we may be out of luck. I do my best to accomodate every client that comes my way, but sometimes we just don't have the time or product needed to do so. If you know you want to change up your color, let your stylist know! They will definitely appreciate you! 4. Why we suggest what we suggest! If your stylist suggests something, anything at all, to you, there is usually a reason why! For example, if you come in for a color service, we will recommend a time frame you come back in for a touch up. If you wait too long, the color could be too faded for just a quick touch up, require a longer process, or require a whole new color period. We don't recommend things just to be recommending! Maybe we notice your hair has gotten too dry in the summer heat, we can help you with that if you just listen! Or maybe you want to try a new color, but we know against your skin tone or eye color, it may not be the most flattering option, we can recommend that and an alternative option! 5. Referrals are really the best compliment you can give us! When you refer your friends, family, even random people who compliment your hair to us, it is such a huge compliment. You're subconciously saying you support us, enjoy our company, you trust us with your own and anyone else's hair, and that we are good at what we do. No one refers anyone to a restaraunt, tattoo artist, hair stylist, or anything they dont love, trust, or like! A lot of stylists even offer referral programs that benefit everyone! 6. We are worth it! If we didn't believe in ourselves, we wouldn't make it in the beauty industry. Confidence goes such a long way in beauty. Our confidence, gives our clients confidence in us as well. But nothing delivers a blow to that confidence like when someone tells you that your prices, your time, etc are not worth it. The price lists hair stylists have are a reflection of so many different things... the area we work in, the cost of our products, the value of our time, the energy and attention that goes into a service, and so much more. We understand that everyone has a budget, completely and totally understand. However, you get what you pay for. Instead of telling someone they are not worth it, maybe try changing the verbage to, "that may be out of my budget right now," or "I would love to have my hair done by you, so I'm going to save up for that!" For example, I've recently had to up prices on my fashion color processes due to the popular demand, amount of product needed, and the attention needed to ensure your hair turns out correctly AND remains healthy. If I'm doing a fashion color, it's not always feasible for me double book myself like I can during a regular permanent color or foil because of that needed attention. People who know the quality of my work, know that I'm worth it and that they will get the best fashion color possible! Keep all of these things in mind when you make your next appointment! I promise your stylist will love and appreciate you for it! Feel free to reach out and say hello on social media and talk to me about your next hair step! in 2013, the ombre trend hit the ground running... fast. The stark contrast between light and dark, red and blonde, dark colors and bright fashion colors quickly took over the trendy world with combinations perfect for every season! While we still see plenty of BEAUTIFUL ombres out there, we are now seeing more of the "balayage" trend. this trend has several names... balayage, sombre, tortoise shell, hair painting, etc. I can best describe it to you as a very natural colored base, with a very subtle, painted on high light. The high lights, have the blended, ombre look, but the amount of high light is very small and focused around the face. This application gives the appearance of a more natural, sun­kissed looked. 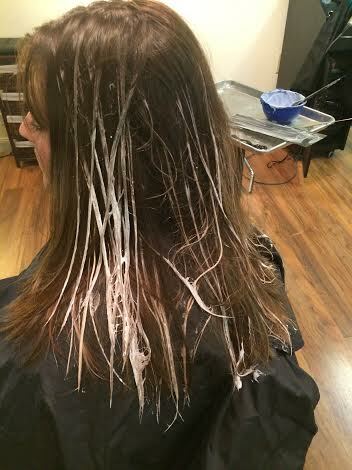 balayage is perfect for any low ­maintance clients who are looking for a little pick me up for their spring and summer hair color! I get to do this process often, but I took some time to do the application on a model, so I could take pictures throughout and show you before, during and after! my model, Amber, came to STLooks with long hair and grown out color and layers. To add to the look, I gave Amber a super cute and trendy shoulder length, layered cut. This cut is super popular this year, especially for the ladies with balayage! Layers love to play in colors. The first cut, removed the bulk of unwanted hair, followed by color, then a final, precise cut. 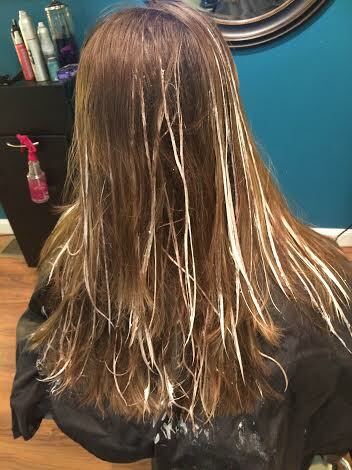 for the balayage process, foils really are not nessesary! I LOVE this. This means that no two balayage will look the same! On top of the individuality, we also save a TON of time! Depending on the look I'm going for, I use a board to paint the hair. For a more bold look, I typically do not use the board. For this subtle look, I used Redken Flash Lift lightener and a board! Her natural hair color is such a rich, gorgeous brown that I decided to work with that and not hit her base with any extra color! After letting the lightener process, I rinsed Amber's hair and decided to use a toner. 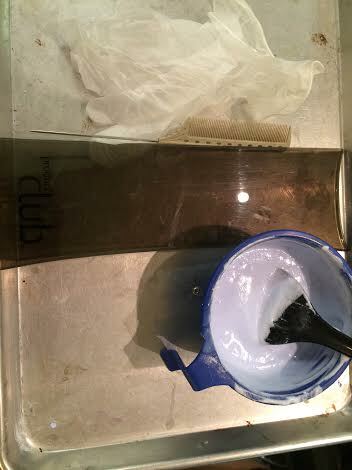 Toners are used to either neutralize or enhance colors! I wanted to enhance Ambers highlights with a really pretty warm, gold violet! So after rinsing, we did one more cut to make sure all cuts were clean, and her layers were perfect! I styled Amber with my 1 1/4 inch Hot Tools curing iron. This size iron produces perfectly sized large curls or brushed-through perfect summer waves! I went ahead and brushed through the curls to really show off Amber's new color! There are so many beautiful variations of this trend. For some people, less is more and , for others, more is more! For Amber, this subtle version is perfect! Just enough to liven up her locks and give her a fresh new look for these warmer months! And as she starts getting out in the sun, her hair will naturally lighten up, giving her a little boost to her subtle high lights. #MOONBEAUTY: so you want to be like Kim K? As a stylist, I see so many trends come and go.... some in small waves, and others in HUGE waves. Right now, thanks to a certain previously dark haired celeb, going blonde in one salon visit is one of those HUGE waves. LBVS here. This is about a big of an ordeal as it is a trend. Don't get me wrong, I can only dream of having lilac white blonde hair myself. But there are some things to take into consideration before making that hair decision! How long is your hair right now? Shoulder length? So if, on average, hair grows 1/4 to 1/2 an inch each month it took you about... 2 years to grow that? How attached are you to the length? Lightener's job is to remove every bit of everything from your hair, which can cause dryness, damage, even the dreaded chemical cut. A pretty significant trim is needed after going blonde. Even if you think it feels good, trim it. We want purposeful cuts and shapes in our hair cuts, NOT chemical induced breakage! Back to that hair that took about 2 years to grow... What ALL has been done to your hair in those two years? Box color? Professional color? Perm? Keratin Smoothing? Kool-aid coloring? BE HONEST! I CANNOT stress this enough. Be. Honest. This will help your stylist make the right decision on whether or not going blonde in one visit is possible, the methods and products to use, and so. Which will help preserve the integrity of your hair, so again BE HONEST! There's nothing worse than a surprise found under that "natural" hair color... old bright hair colors, use of metallic dyes (HUGE NO NO) and just plain old chemical cutting. A stronger lightening product may be needed for old hair colors and it should be noted that lightener can react negatively with metallic dyes and cause serious damage to your hair. A perm chemically alters the structure of your hair, those bonds may no longer be strong enough to handle going blonde in one visit. permanent, meaning they will last up to 6 ish weeks... depending on the condition of your hair, your wash schedule (read all about wash schedules here...! ), you may need to come in weekly or bi weekly to maintain the desired cool as well as even tone. Even the goldilocks blondes may need toner to make sure it's an even all over color. Ask your stylist about how long the service will take and how much it will cost, to make sure you're staying in your budget and you can always call me for a professional consultation! How committed are you REALLY to being and staying blonde? Are you ready to maintain roots every 4­-6 weeks? Against the lightest of blonde hair, any natural hair color is going to look DARK, which can drive anyone CRAZY. 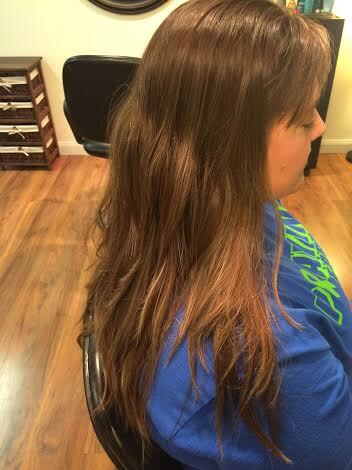 As previously mentioned, hair grows about 1/4 to 1/2 an inch every month. Although you may have to visit the salon more often, root touch-ups are much easier and less time consuming (and less expensive) than the initial process! If you still feel like you want to try going blonde in one process, talk to your stylist ahead of time. Make sure she/he has allotted enough time for you in their schedule, is prepared with the needed product, and they may want a consultation with you before hand. If you don't have a stylist, PLEASE FIND ONE (or call me). Prevent excess damage to your hair and possible injury to yourself by NOT doing this at home or unprofessionally! Your stylist can also be prepared to send you home with products that will keep your hair healthy between visits! 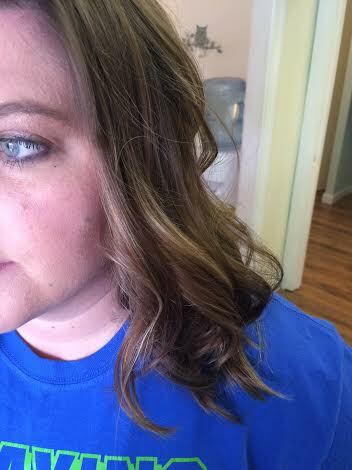 If your stylist recommends you take a slower approach to going blonde, LISTEN TO THEM! They are the professionals! They can make educated decisions to keep your hair in the best health possible. If you don't believe your stylist, get a second and third opinion from other stylists in other salons! Then make your decision! Do you have any experiences with going blonde in one salon visit? Tell us about it in the comments!